When I was a kid, my mom made big to-dos out of planning birthday dinners. She would always cook an elaborate version of Whatever We Wanted! I remember one year on my birthday, sitting at the round kitchen table, pine cabinets and burnt red laminate floor panels lining the perimeter of the room, an aura of dim orange light seeping out of the Tiffany pendant lamp my grandfather had welded years before. I fidgeted in my chair while my mom stalled, adding a dash of this or that, buying time so my sisters could tear away from their homework and slide into their chairs. Then she placed the mounded platter onto the center of the table, and I got to serve myself first. I don’t even remember what type of cake I liked. Ice cream, I think. But that chicken. Oh, man. 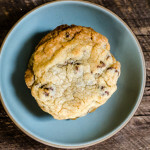 The golden brown salty crust, craggy corners filled with nothing but crunch and the inside all juicy and soft. I still swoon. I’m sure my childhood addiction was part novelty. 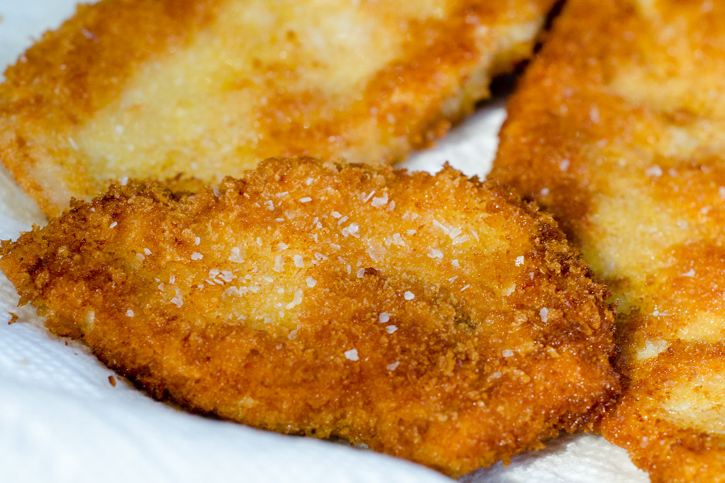 Fried cutlets weren’t in the weekly, or even the monthly rotation, which fed the craving. My dad had a heart attack at 45, when I was nine. It was scary enough that my mom did two things: Dusted off and passed around her resume, and swept the salt (and vegetable oil) right out of her kitchen. Fried, salted, buttery foods were replaced with brown rice stir-frys, baked chicken, salad greens spritzed with lemon juice, and plain steamed vegetables (at least for a little while). So, on the day I turned ten, that first bite of salty, crunchy chicken felt more extravagant than licking three inches of buttercream icing off a gooey chocolate cake. I remember silently willing the rest of the family to stop eating that night, so I could bring a leftover chicken cutlet sandwich to school the next day, and maybe pop a piece in the toaster for an afternoon snack. I may have wished for more dinners starring chicken cutlets as I blew out my birthday candles. It’s been twenty-seven years to the day after that tenth birthday party, and the craving hasn’t ebbed. Yesterday, to celebrate, we went out to dinner because, honestly, there’s no better present than being served a meal and not having to clean up afterward. But, I made cutlets a few days ago, an early Happy Birthday to Me! I also made them a couple of weeks ago, and a few weeks before that. 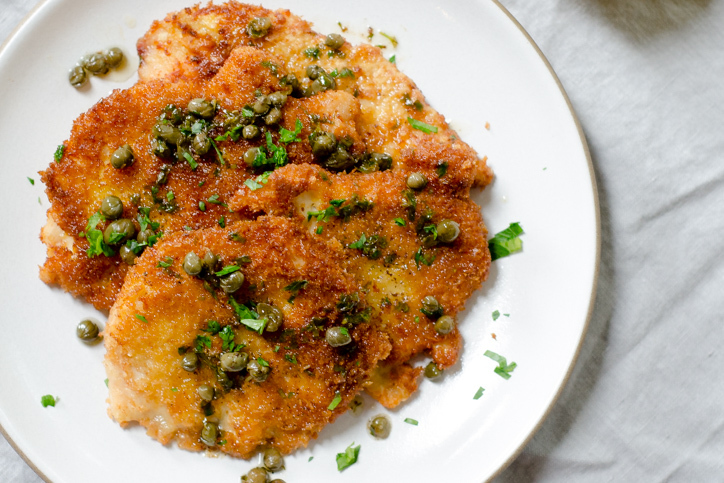 Chicken cutlets aren’t all that uncommon in our house. As I am pulled farther away from my childhood, or maybe as my kids become more firmly entrenched in theirs, I find myself cooking more of the foods my mom used to cook for me. Maybe I’m trying to preserve my childhood memories, or maybe my subconscious is pushing me toward the safety of what I know, but I’m slowly backing away from trends, and spending more time riffing on my childhood favorites – pasta with pesto or meatballs and red sauce, simple roasted chicken and vegetables, the occasional stir-fry, and of course, chicken cutlets. Still, my chef side won’t let me make anything exactly the same way twice (or at least twice in a row). So, sometimes I indulge the kiddos and serve crunchy cutlets with a puddle of ketchup for dipping, and sometimes I serve them with a dollop of pesto. 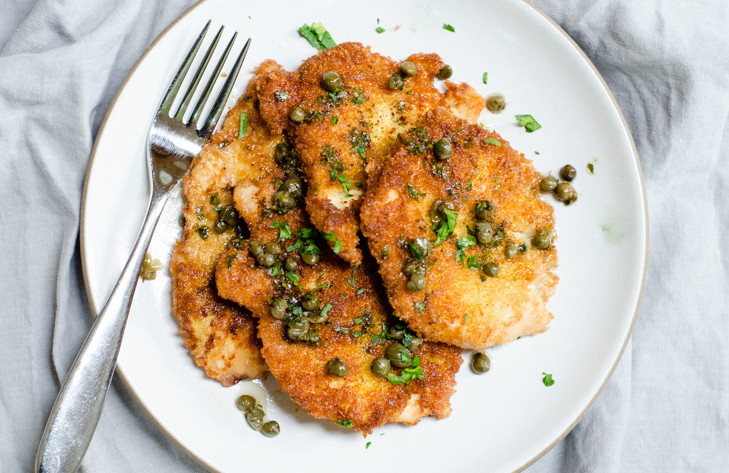 Today’s recipe is a little more grown up, with browned butter, fried capers and a spritz of lemon juice. It comes from Ben and Karen Barker’s Magnolia Grill restaurant cookbook, Not Afraid of Flavor, and regularly appeared on their family dinner table when their son Gabriel was growing up. I’ve cooked one version or another of this sauce so many times, but this particular one is in perfect balance, with salty capers, sour lemon juice, nutty richness from the butter, and grassy notes from the parsley. The sauce is the perfect, bold foil for crunchy, white meat chicken, and makes it even more addictive than I ever thought possible. This dish is a bridge between my childhood and the one I hope to provide for my kids – part nostalgic and part new – and wholly delicious. It’ll be hard not to make this one twice. 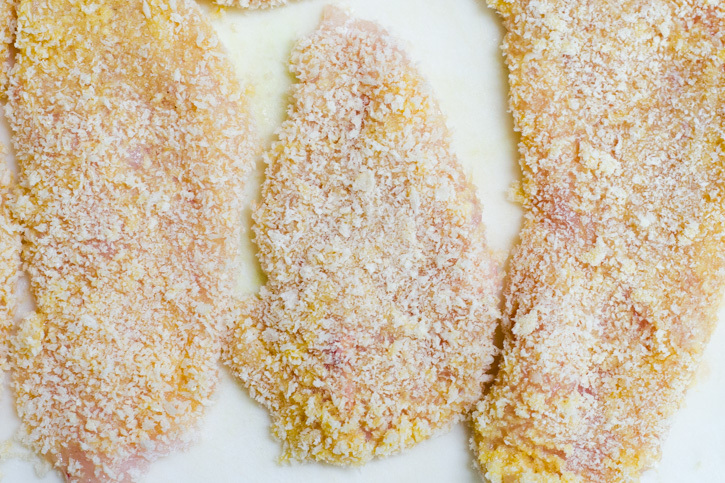 The key to perfect chicken cutlets is regulating the temperature of the pan. The goal is to create a golden brown crust in the same time it takes to cook the inside of the chicken. At 1/4-inch thick, it should take about 4 minutes on the first side and about 3 minutes after flipping. If the pan is too hot, the coating will burn before the chicken is cooked through, and if the heat is too low, the chicken will dry out before the crust browns. If you don't have a 12-inch pan, use a smaller one and cook the chicken in batches, but don't crowd the pan or overlap the meat. 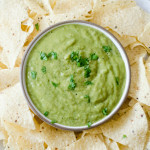 The caper sauce is adapted from award-winning pastry chef Karen Barker's family-friendly recipe, found in the Barker's Magnolia Grill restaurant cookbook, Not Afraid of Flavor. The chicken in this recipe serves 2 adults and 2 kids with a liberal amount of sauce (the kids don't eat much of it), but you should add another whole breast to serve four adults with the same amount of sauce. The recipe can be easily doubled to serve 8. 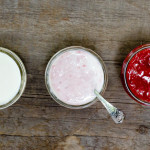 Try the sauce over cod or salmon, angel hair pasta with shrimp, or roasted cauliflower. It comes together in minutes for the perfect weeknight meal, and elevates typical casual kid food to something a little more elegant but still pleasing to the whole family. And, if your kids would rather dip the chicken in ketchup than eat it with the sauce...well, so be it. They don't know what they're missing! 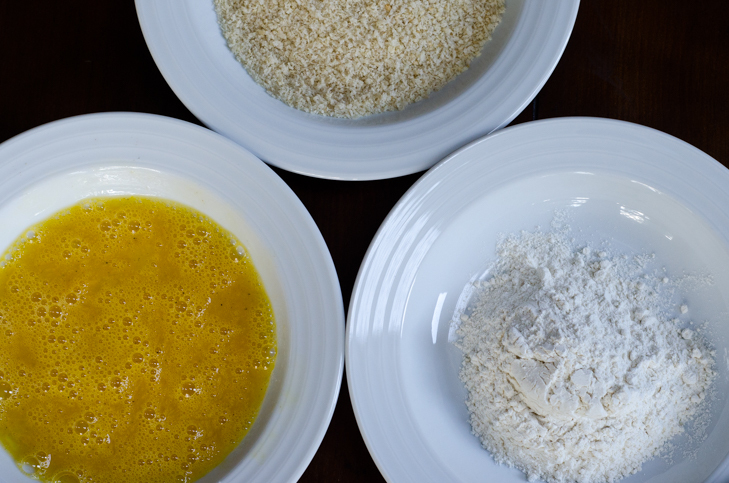 Pour the panko into one medium-size plate or shallow bowl. In a second, combine the flour and salt, and in a third, beat the two eggs with a fork. Rinse the chicken breasts and pat dry. 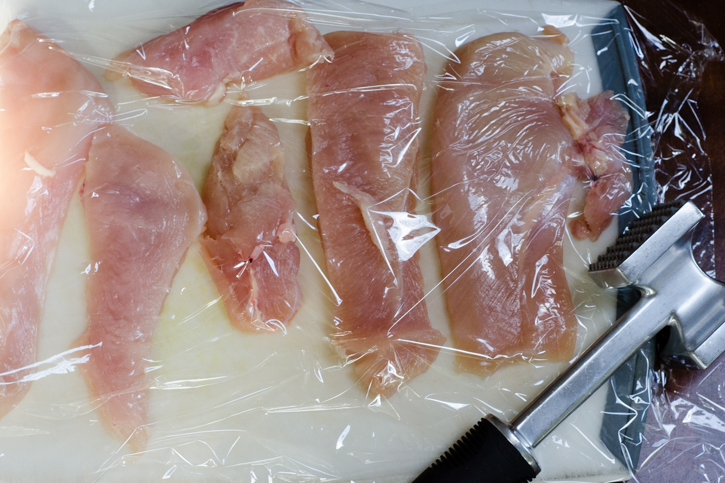 On a cutting board, remove the tenders from the breast, so you have 4 pieces of chicken. Lay them flat on the cutting board, evenly spaced, and lay a piece of plastic wrap over the top. Beat the chicken with a meat tenderizer or a heavy spoon until they have flattened to about 1/4-inch in width. 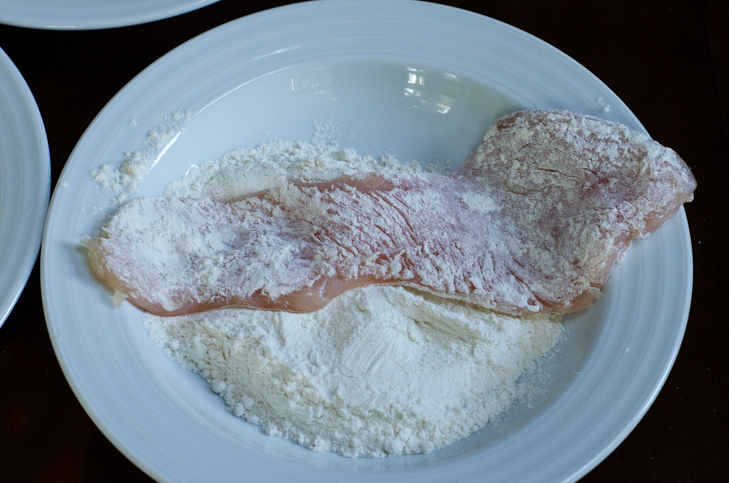 Dredge the chicken by first coating it with flour. 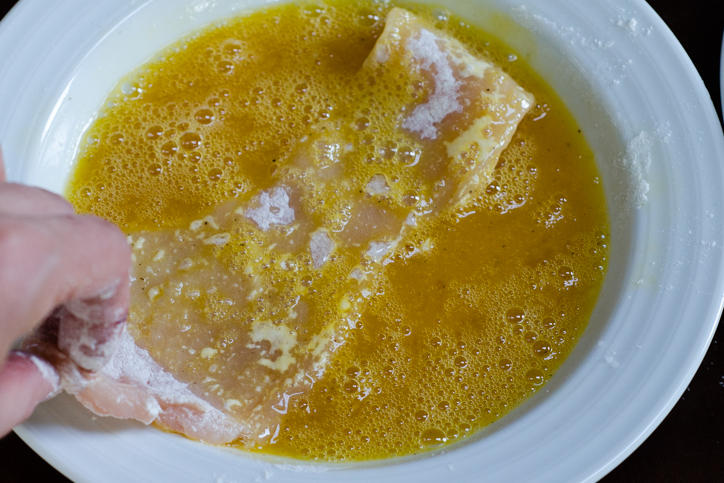 Tap off excess, then dip the chicken piece in the egg mixture. Finally, coat with panko. Repeat with remaining pieces of chicken. Heat a 12-inch skillet over medium-low heat until it gets good and hot, about 2 minutes. Add the olive oil and the chicken, in a single layer. Panfry the chicken, undisturbed, until it is opaque around the edges and golden brown underneath, about 4 minutes. Turn the chicken and repeat on the other side for three to four minutes, until it is cooked through and golden brown. 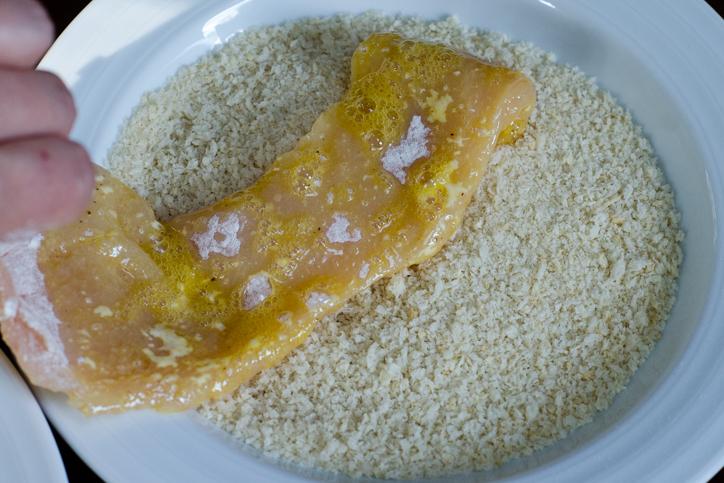 Remove to the platter, sprinkle lightly with salt and place in the warm oven. Repeat with a second batch of chicken, if necessary. 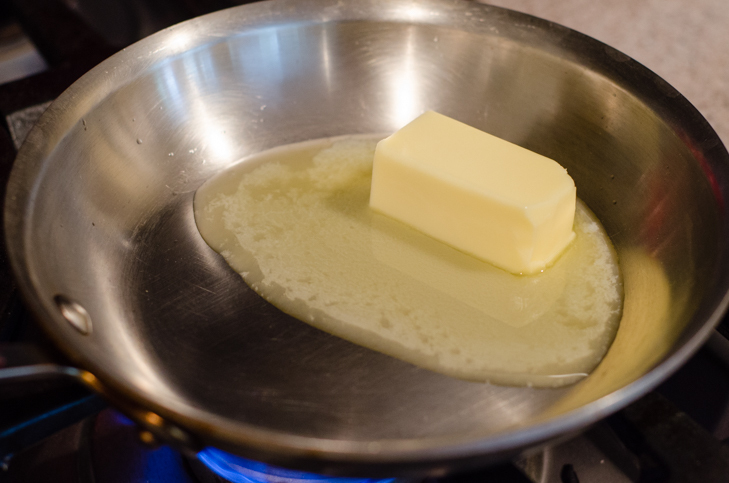 Melt the butter in a small 6- or 8-inch pan (light-colored, so you can see the transformation) over medium-low heat. 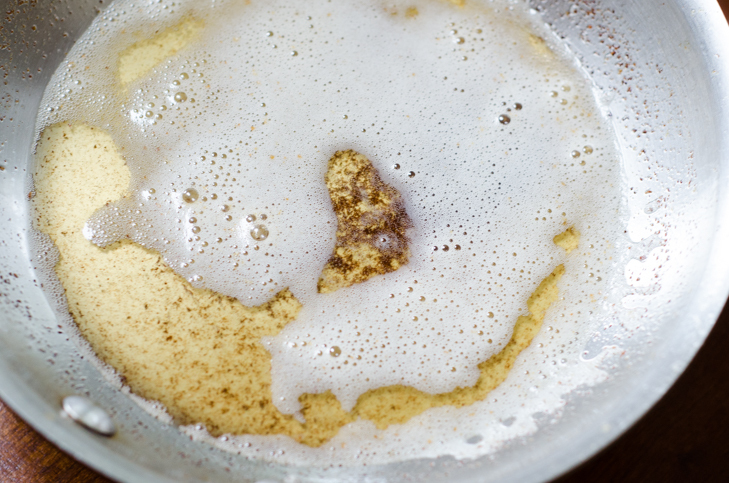 After about five minutes, the butter will begin to foam and spit as the water content evaporates. At this point, start swirling the pan lightly but constantly, so you can see what's happening through the foam and to move the browned bits around so they don't turn black. Cook for about a minute more, until you smell a rich, nutty aroma and the butter itself begins to turn a nice amber color. 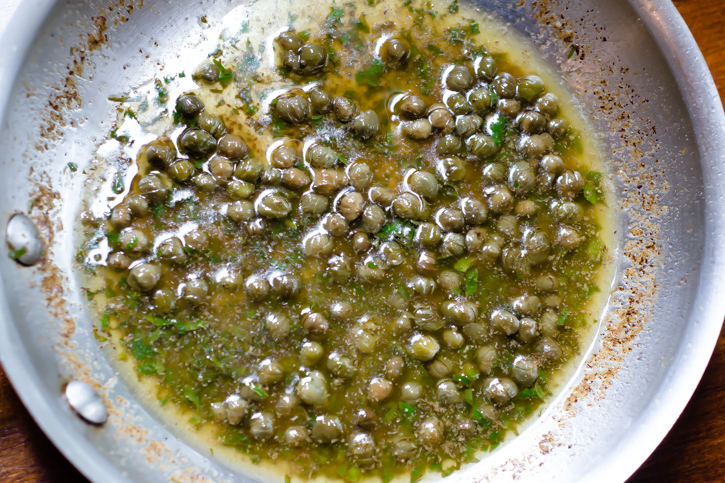 Add the capers and fry for 30 seconds. 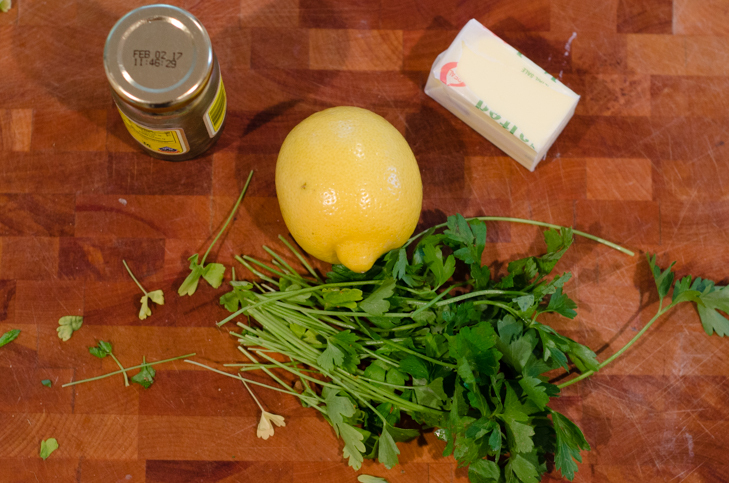 Remove the pan from the heat and add the lemon juice and parsley, stirring to combine. Remove the paper towels from under the chicken and arrange the meat on the platter. Pour the sauce over the top (or offer it on the side if family members protest) and serve immediately. Leftover chicken can be refrigerated for up to 3 days and reheated in a 350 degree oven for about 10 minutes, until heated through. Cold chicken is also a great next-day lunch, as part of a sandwich with lettuce, cheese, and mayonnaise. I like to serve this dish with roasted cauliflower and pour the sauce over everything. Beautiful blog entry, Steph! I will by trying this recipe for my family – it looks delicious and seems to be wrapped in the kind of nostalgia I aim to create for my boys too. Thank you for sharing your talents! Thanks for reading Steph! So sad I didn’t get to see you this summer. Hope all is well!